Jordan School District is committed to serving students by providing opportunities for them to realize their potential as contributing citizens and life-long learners. 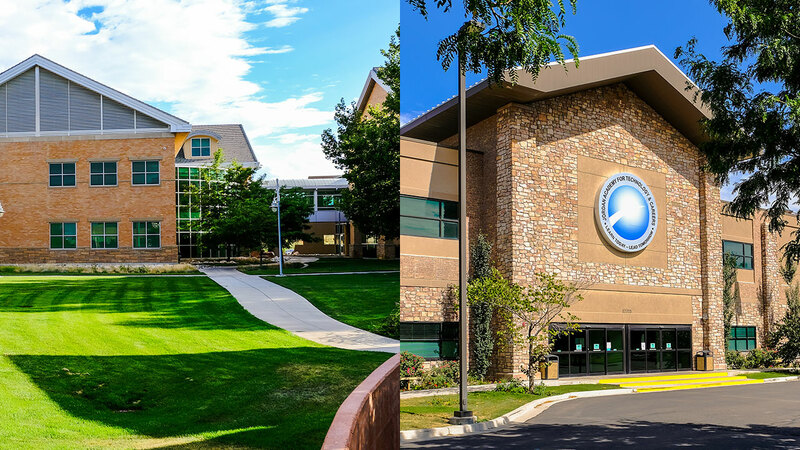 To better prepare our students for college and future careers, Jordan School District is has programs in a state-of-the-art facilities located on the Jordan Campus of Salt Lake Community College and Riverton. The Career and Technical Education department in Jordan School District has a well-earned reputation for providing high-quality programs staffed by skilled educators, who are supported with excellent equipment and training. Jordan Academy for Technology and Careers facilities and the accompanying programs build on these strengths. Articulation and collaboration with Salt Lake Community College and other post-secondary institutions enhance a seamless transition for students into further education and careers. Students who take advantage of this great opportunity prepare to further their education or to enter the workforce with skills and experiences needed for success. Biotechnology – Students learn to apply scientific and engineering principles and practices to assist in the development of new materials or to modify micro-organisms, plants, and animals. Commercial Aircraft Pilot – Students learn the fundamentals of aviation, principles of flight, aircraft operations, weather, navigation and safety. This program operates on the basis of the Federal Aviation Administration (FAA) rules and regulations. Computer Programming – Students learn to design, code, and test their own programs using programming languages including C++, C#, Java, Python, and/or VB. Dental Assistant – Students learn to assist dentists with routine clinical procedures, laboratory processes, and administrative duties. Digital Media – Students create and learn using elements of text, graphics, animation, 2-D and 3-D graphics, sound, video, and digital imaging. Engineering – Students learn to design, produce, and experiment with prototypes (models) in a variety of engineering fields including CAD, CAM, digital electronics and pneumatics. The program incorporates Project Lead the Way. Medical Assistant – Students learn to assist with the treatment and care of patients in both administrative and clinical procedures. Nurse Assistant (CNA) – The certified nurse assistant program is a semester course available to juniors and seniors who are at least 16 years of age. This course provides an introduction to the healthcare field and the role of the nursing assistant. Occupational Therapy – Prepares students to provide services to children and adults whose lives have been disrupted by physical injury or illness, developmental problems, the aging process and psychosocial dysfunction. Pharmacy Technician – Students learn to assist pharmacists in providing pharmaceutical services and care to patients. Physical Therapy – Students learn components of physical therapy including: anatomy and physiology, basic principles of injury prevention, recognition, evaluation, and management of physical rehabilitation. Surgical Technician – Students learn to assist during surgery. Skills include: proper sterilization, patient after-care, instrument handling and surgical inventory. Veterinary Science – Students learn to function as professional technical support to veterinarians. Skills include animal care and treatment, clinical pathology, outpatient care, dental prophylaxis, surgical assisting, and other advanced procedures. Barbering – Students are prepared to cut and dress hair, shave and trim facial/neck hair and beards, and customer relations and salon management. Emergency Medical Technician (EMT) – Students learn skills to function as an EMT-Basic and to administer Basic Life Support. Fire Science – Students learn teamwork building skills that help allow members to safely fight fires in a variety of situations including structural, wild land, automobile, and Hazmat incidents. Landscape Management – Students develop knowledge and skills in sustainable agriculture, urban farming, nursery operation, and landscape management. Nail Technician – Students shape fingernails and toenails, remove unwanted skin and blemishes, apply polish and cosmetics to nails, and function as licensed manicurists or nail technicians/specialists. Teacher Education – This course is designed to help students decide if they would like to pursue a career in Special Education, Education, or other careers in disability services. Welding – Students are prepared to apply technical knowledge and skill at an advanced level to use current welding processes, including robotics welding.